“The platinum drugs — cisplatin, carboplatin, oxaliplatin — are the [most common] drugs used to treat cancer,” says Anthony Windebank, M.D., a neurologist on Mayo Clinic’s Rochester, Minnesota, campus. But in 30 to 40 percent of cancer patients, these drugs can cause enduring pain in the hands and feet, says Dr. Windebank. Peripheral neuropathy significantly changes patients’ quality of life. Some interpret the pins and needles of nerve damage as pain. For other, it’s numbness. When it affects feet, the nerve damage can affect balance and gait. But it’s not clear who is most at risk from this side effect. Researchers in Dr. Windebank’s lab are trying to find out and discover if there are ways to protect nerve cells prior to chemotherapy. And for the first time in science, they’re doing it using fruit flies. Fruit flies in a vial. Not surprisingly, the first reference you find when searching online for “fruit fly life cycle” is to a pest control company. But research on fruit flies, or Drosophila melanogaster, has led to a handful of Nobel prizes and advanced knowledge of how genetics contributes to disease. For more than 100 years, fruit flies have been an important research model because they are more like us than we may realize. Many genes that contribute to disease in humans have matching genes in fruit flies. These matches between species, called “homologs,” mean that tests on the flies can give information about the same gene in humans. “The estimate is that between 70 and 80 percent of disease-causing genes in humans have direct homologs in flies,” explains Christopher Groen, Ph.D., a research fellow in Dr. Windebank’s lab. And because fruit flies are a simple system and their genetics have been sequenced, things that are hidden become clear. Researchers in the lab had been studying this problem of nerve damage caused by platinum drugs using animal models for years, explains Jewel Podratz, a senior research technologist in Dr. Windebank’s lab. Although she says the team learned from these studies, they believed genetics played a major role in susceptible to peripheral neuropathy, so the team switched models. “Initially, we thought about using the flies with modified genes to see if particular genes make flies more susceptible to the chemotherapy drugs,” says Podratz. And with flies, you can look at a lot of genetic mutations quickly to see if you have ones that become more or less susceptible. “That gives you clues as to mechanism [and] why some patients would be more susceptible, compared to others,” she says. 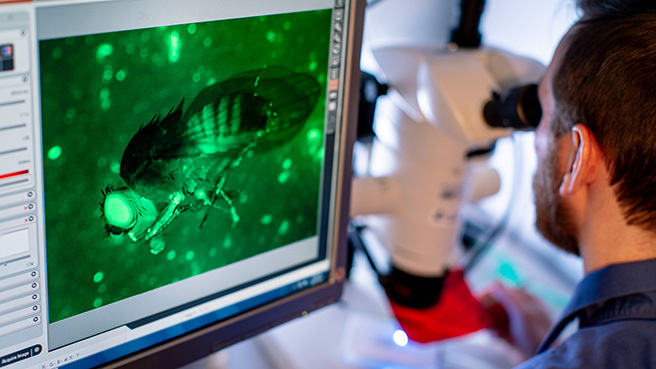 To investigate and test the effect of the drugs on flies, the team uses the fly’s inborn climbing behavior. In other places, you might need to hire experts, pitch the idea to an engineering company or make it in your garage, says Dr. Windebank. But, fortunately, that’s not the case at Mayo. “We had a team of programmers and engineers who specialized in each part of the process, and we eventually built one to use and one as a spare,” adds Podratz. In the completed apparatus theater lighting surrounds the row of vials, which are arranged like a Rockettes chorus line on a plastic beam. At set intervals, the beam rises up and then swiftly drops with consistent force. 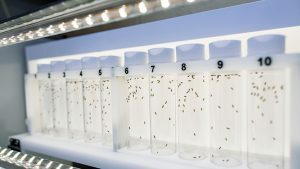 After a period of time, a camera takes a picture of the vials and a software program records the number of flies above a certain point in the vial. In 2015, Cassandra Johnson, a lab member and Ph.D. candidate in the Mayo Clinic Graduate School of Biomedical Science, published a paper in the Journal of the Neurological Sciences on the risk factors between patients with lung cancer who did or did not develop nerve damage. Her team was able to identify certain genes and gene changes that appeared more often in patients who developed nerve damage after chemo than in those who did not. Based on that information, researchers in Dr. Windebank’s lab decided to see if results from the fruit flies matched. “We kind of used it to verify the model,” says Dr. Groen. And they did, eventually publishing their results in Fly. But as they were setting up the experiments to start the large-scale screening efforts, they ran into another problem. “We were testing our control flies, and we found that one of our control strains was really, really resistant to cisplatin,” says Dr. Groen. In this case, that means it takes a very high dose of the drug to cause any climbing deficiency in the flies. The mutation in that strain ended up in a part of the DNA associated with how mitochondria function. When Dr. Groen presented his findings at a department lab meeting, he was approached by a colleague, Eugenia Trushina, Ph.D., who is studying a drug that affects the same mitochondrial function. With a drug or a drug target, the teams hope to identify a way to protect patients from the nerve damage caused by cisplatin without affecting its cancer-killing ability. But in the meantime, even the genetic information is helpful. “Our original goal with a large-scale genetic screen was to identify a list of genes that might make patients more susceptible to nerve damage. We foresaw that as a genetic test for patients who were about to get cisplatin treatment allowing the predictions to modify the treatment plan,” says Dr. Groen. “But, now, with a target, you can try lots of different drugs,” continues Dr. Windebank. So although this discovery is not ready for the bedside quite yet, it has yielded three pathways forward: as a way to individualize cancer treatment, as a way to test a new drug, and as a way to screen for existing drugs — all from studying fruit flies. Which makes sense, says Dr. Windebank.